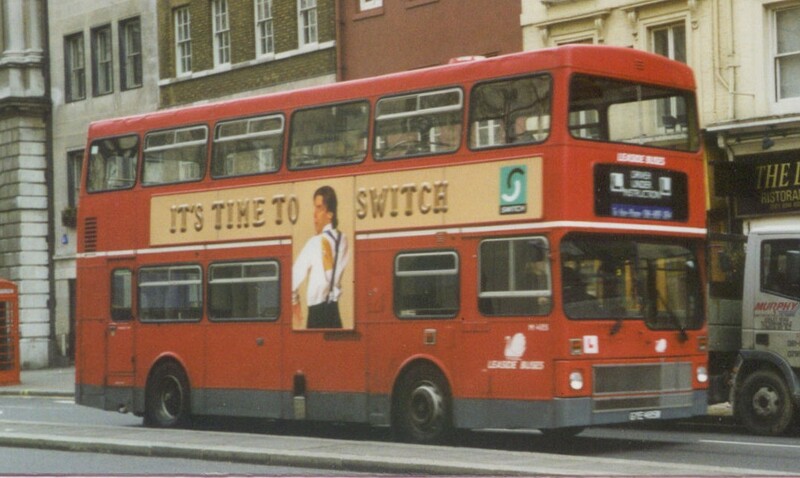 In 1977 London Transport was looking for large numbers of buses to replace the Fleetlines, Merlins and Swifts that had been less than triumphant at RT replacement around the system. The Titan was its bus of choice, but delivery in the quantities required by LT was not going to be possible. They needed something else. They had been impressed by the Metro-Scania Metropolitan MD class, except for the tendency to corrosion in the all-steel bodies. So they took a look at its successor, the MCW Metrobus. 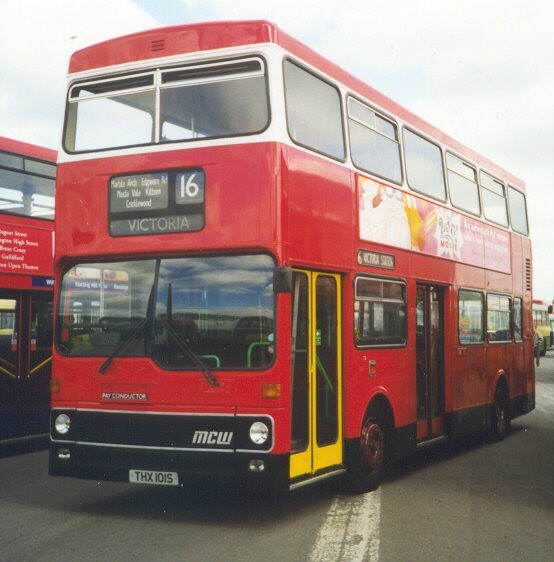 MCW's demonstrator, TOJ 592S, was borrowed at the end of 1977 for evaluation. 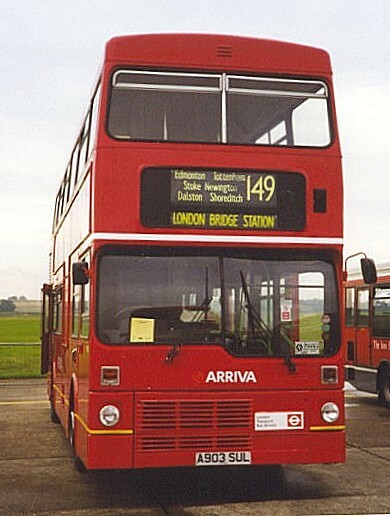 Five buses to London's specification arrived in 1978-9. They had Gardner engines and MCW H43/28D dual-door, centre-stairway bodies. They sported the type-mark of split-level windscreens, like the MD and MS classes. They were easily distinguishable from later Metrobuses by the front display, which was three-part rather than two, with the aperture just the required width rather than much wider. Initially they were to be the MT class, but someone must have foreseen innumerable jokes about MT buses, for they became just M1-5. 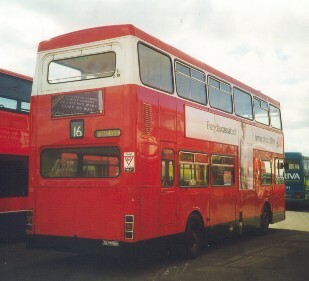 Doyenne of the Metrobuses, M1 became a showbus, and operated for Metroline restored to original livery (less LT roundels). 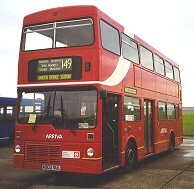 It is seen here at Cobham Bus Museum Open day, April 1999. 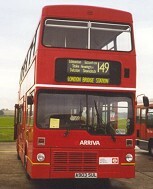 Initial livery was red, with white upper window surrounds and a black grille and front bumper. MT1 uniquely had a black skirt, which it has retained since. The livery on M2-5 was simplified to plain red at first overhaul. MT 1 arrived in April 1978, followed by MT 2 and MT 3 by July. They were renumbered to M1-3 in July. After testing M1-3 were allocated to Cricklewood, operating from October 1978 as crewed buses on routes 16 and 16A (Victoria - Neasden), M4-5 joining them in 1979. London Transport must have been pleased with them, or very desperate and ordered 200 for delivery as soon as possible, in 1978-9, followed by another 200 in 1979-80. This was followed by a requirement for another 100 in 1980 once the impending hiatus in Titan production became apparent. 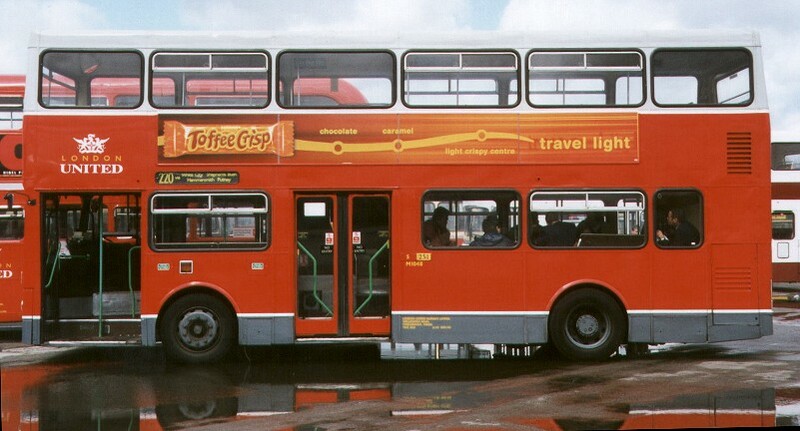 The production Metrobuses for London were very similar to the trial batch, with minor detail changes to the body (such as the front marker lights / indicators). The biggest visual difference was to the front display, where a two-panel blind display was enclosed in a much wider blackened aperture (thereby preventing use of the prime front advertising spots). M6-55 continued the attractive practice of outling the upper window area in white, but the dead hand of accountancy squashed this in favour of plain red from M56 onwards. M6-55 also had reflective number plates, whereas later ones reverted to black and white. M6-205 were delivered with automatic fare collection machinery, which cost 4 seats, making these H43/24D instead of H43/28D. M206 onwards received circular foglamps instead of rectangular ones. M6-255 were delivered without nut cover rings. 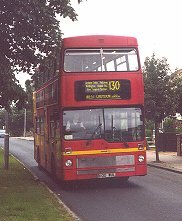 March 1979 saw the entry into service of Metrobuses on the 110 and 270, based on Fulwell garage. This displacement of Leyland National LS single-deckers and Fleetline DMS double-deckers was typical as the Metrobuses flooded into the northern and western sides of the London Area. They went to Fulwell (FW), Norbiton (NB), Southall (HW), Turnham Green (V), Alperton (ON), Hendon (AE), Willesden (AC), Stonebridge (SE), Cricklewood (W) Finchley (FY), Edgware (EW) and Hanwell (HW), establishing an area of employment that has persisted for twenty years. 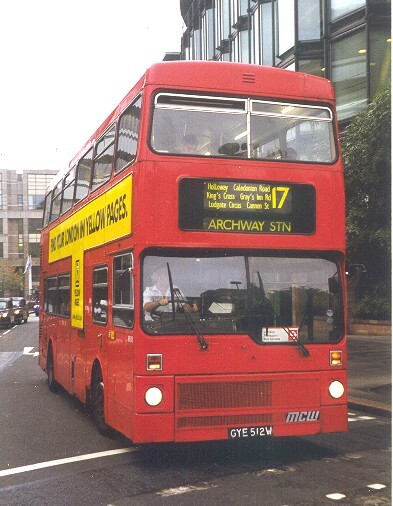 By December 1998 this Metrobus, probably M485, had been demoted to training duties for Arriva London North, although it still wears its old Leaside Buses livery as it rumbles through Aldwych. 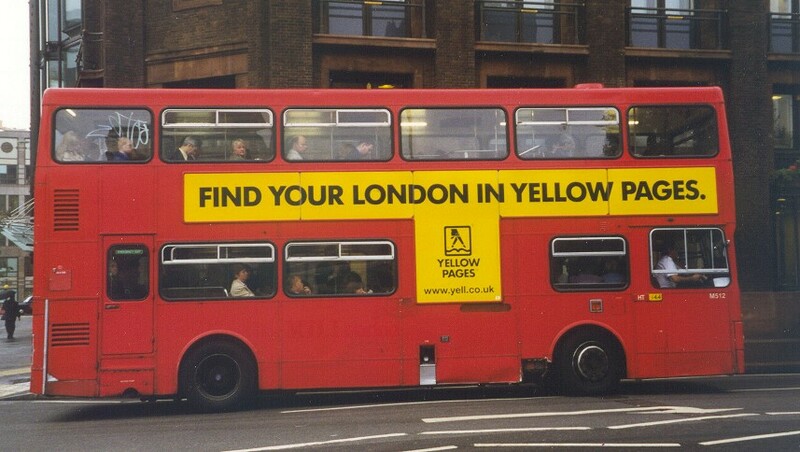 London Transport was keen to improve the services to and from Heathrow Airport and in November 1980 started Airbus services A1 and A2 (Heathrow - Victoria / Paddington). For this they needed modern vehicles, and decided on a dedicated fleet of sixteen new Metrobuses. These had most of the downstairs seats removed, leaving the bench seat and four others, while the space was occupied by massive luggage racks. Ordinary bus seats were used upstairs. The H43/9D buses were allocated to Stamford Brook (V) garage. Extra Airbuses were soon needed, and M447 was converted to full 2M3 specification in March 1982. This was followed in April by M211, M232 and M256. 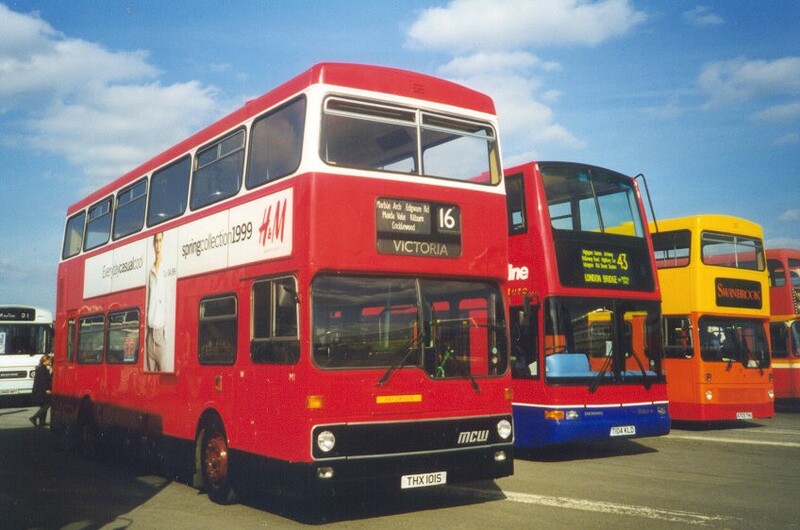 For further summer augmentation two more buses were given the livery but not the modifications: M420, M479. 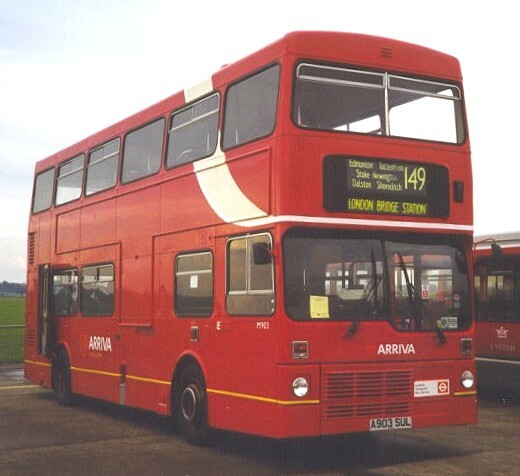 A minor livery variation on the Airbuses soon became standard: the front grille on M427 had been painted red instead of black experimentally, and this was applied to the whole Airbus group in 1981. The advent of the newer Airbuses with coach seating in 1984 rendered these first Airbuses redundant, and they were modified back to normal 2M2 specification, becoming indistinguishable from other early production buses. 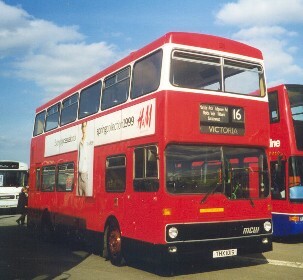 The problems with Titan production began to affect London Transport's dealings with MCW for the 1981 batch. LT had been dual-sourcing the two buses, but Leyland made it clear that if it was to go to the expense of setting up a new production line in Lancashire it wanted all of LT's 1982 order to make it worthwhile, but could only manage 150 vehicles in 1981. MCW was not pleased. It faced a large peak followed by a trough in its production schedules. Stop/start building is inefficient and the sheer size of London's orders compared with the rest of the UK market did give several manufacturers problems of this sort. So LT spread the 300-bus order for 1981 so that 75 of them would be delivered in 1982. 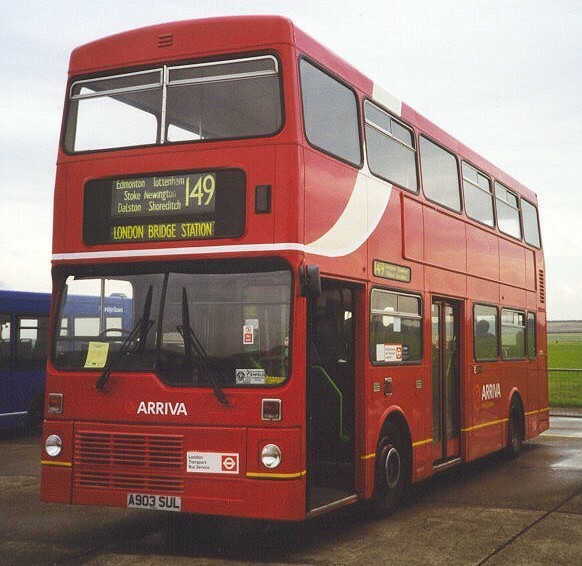 In September 1998 M512 operated for Metroline London Northern, and like most of its contemporaries had lost the trims on its front grille. It is seen here at St Paul's on route 17. This batch had updated mechanical gear which resulted in the buses being kept separate. Initially they almost all went to Leaside District in the north of London. The exceptions were the last six, which went to Sidcup for comparative trials against Titans and DMS Fleetlines. A visual change from earlier Metrobuses was the provision of extra grilles at the sides of the engine compartment. Another change during production (from M706) was the abandonment of the horizontal slatted grille over the radiator, a mesh grille now covering the hole while a chrome beading maintained a semblance of style. Production for London resumed with an order for 150 for 1983 delivery, 150 for 1984 and 335 for 1985, with 35 of the last order in late 1984 please! (Spot when Leyland dumped Titan production). M953-963 had experimental advert frames fitted to the rear. 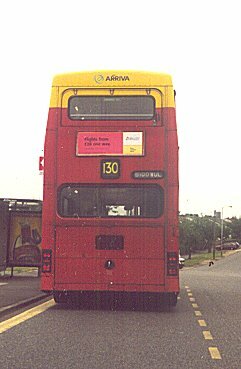 The success of these was followed by widespread application of advert frames to sides and rear of Metrobuses throughout the fleet from 1985 onwards. M1371-1440 were all tachograph-fitted from new. M903 shows the later style of grille, and the Arriva London North livery that replaced the earlier red with white stripe and grey skirt of its Leaside Buses days. It shows off its new livery here at Duxford, at Showbus 98. This tide of Metrobuses went to work all over the London outskirts, with the exception of the east and south-east (where Titans predominated). They routed the remaining Fleetlines (DMS) and replaced many single-deckers. The relatively new Leyland Nationals were among the classes affected. The last deliveries were in January 1986. Over the years they have had a mixed reception, with some commentators remarking that they had never had a smooth journey on a Metro. However, it must be admitted that they have stood up to the rigours of London operation better than the Merlins, Swifts and Fleetlines that preceded them. The earlier Airbuses were converted to normal. Despite the extra size of the new batch, extras were again required for summer season workings, and for the 1984 season M233, M372, M401, M420, and M479 were converted to H43/5D configuration, whilst for summer 1985 it was M1184, M1187, M1188, M1190 and M1191. 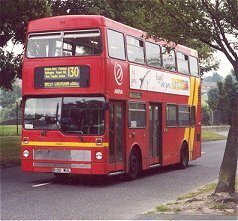 The Airbus Metros were displaced in 1995-6 by new Volvo Olympians with stylish Alexander Royale bodywork, and by Duple Darts. The Airbus Metros received downstairs seating, but retained their upstairs coach seating, making them DPH41/28D. Immediately following on from the Airbuses was a batch of twelve Metrobuses fitted with public announcement speakers and microphone sockets inside, and luggage racks. With ordinary bus seats, they found their way onto ordinary bus services from time to time, and as they were all tachograph fitted they could be used for private hire work too. They were allocated initially to Victoria (GM), from July 1984, and were transferred to Stockwell (SW) in November 1985. However, their time on the Tour was brief. 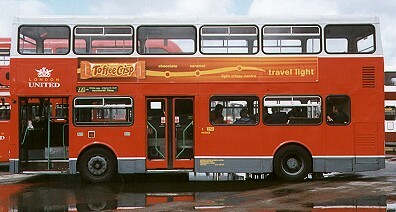 They were displaced in 1986 by the revamped London Coaches operation using fifty dedicated Routemasters (some open-top). 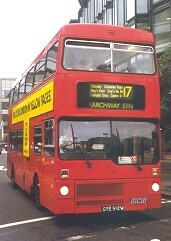 After its spell on the Tour M1048 reverted to ordinary bus use. 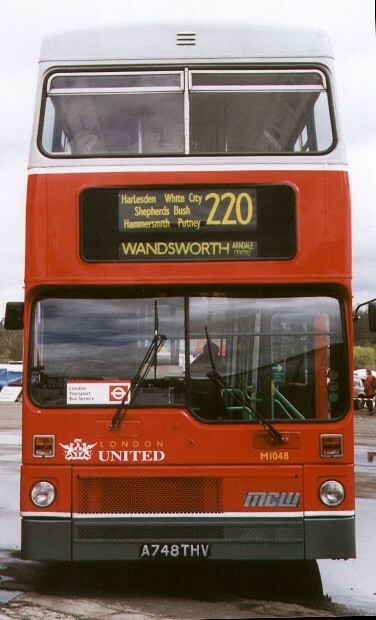 Privatised to London United, it was one of the first to wear the new London United livery, shown off here at Cobham Museum Open Day in April 1998. This batch had Cummins L10 engines, but were visually the same (apart from M1104, which had a white wrap-round advert proclaiming its engine type!). They entered service from Brixton (BN) in November 1984. They have since collected at Croydon (TC), specialising on the long hilly routes out to the south, such as the 130 (and latterly the 466). Despite the Croydon Tramlink taking over most of the 130 business they have survived, being retained in preference to the Gardner-engined variety when the trams arrived. Tramlink survivor. 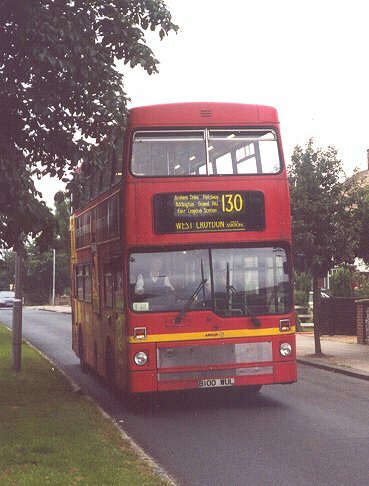 M1100, one of the Cummins-engined batch, works the remnant of once-busy route 130 in July 2000, in New Addington. After the main production run of Metrobuses, London Transport was looking for a follow-on type: the next generation, to follow on from the Titans and Metrobuses. It set up the Alternative Vehicle Evaluation (AVE), with sample buses from a variety of manufacturers: the Leyland Olympian (L1-3), Dennis Dominator (H1-3), Volvo Ailsa (V1-3) and Mark II Metrobuses M1442-3. There was to have been a third AVE Metrobus, a Mark III, but this never materialised. The grille arrangement was rather distinctive; with a slotted bumper and a small rectangular aperture in front of the driver. 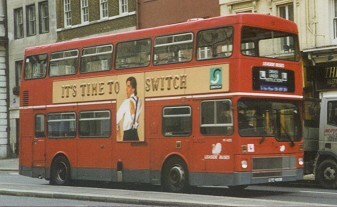 The two buses, M1441 with a Gardner 6LXB engine (5M7), M1442 with a Cummins L10 (6M7), were delivered to London in July 1984 and entered service in August working from Stockwell on the trials routes: 170 on weekdays, 44 on Sundays. 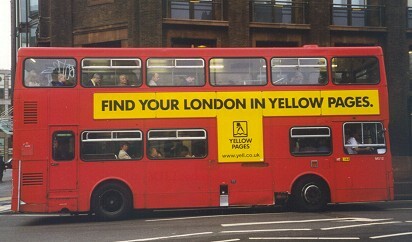 They later passed on to South London at privatisation. 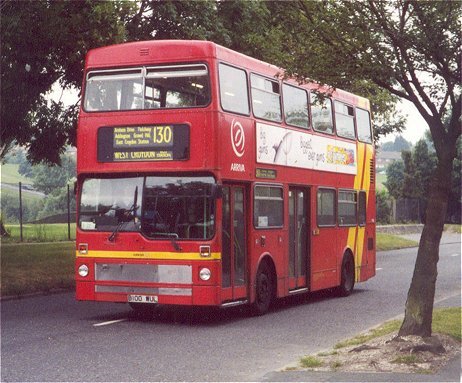 London Buses bought a number of Metrobuses for its tendered operations, from various operators. These could be distinguished by their forward staircases and lack of central exits. Some were Mark IIs, and a couple had Alexander RH bodies rather than the standard MCW variety. These will be considered in Part 2. Bus Stop Part 1. Part 2. bus histories. photo refs.